Now we are going to look at the high end RS622 from Robomow. This is a great robotic lawn mower that is aimed at the larger lawns. Making your life so much easier and giving you a perfect lawn this is a great option. This is one for the larger lawns of up to 2,000 square metres. Anyone who has a lawn this size knows it takes a long time to cut or you need to pay a gardener. The RS622 is a great alternative to paying a gardener and also a great alternative to a lawn tractor. It will cut your lawn as often as you want leaving you with a perfect finish all year round. It’s a big investment but will easily earn you back your money in no time. The features allow you to get a great finish to your lawn and also control it from anywhere. This is a real luxury robot lawn mower. These are a few of the top pros that the RS622 offers but there are so many more that you can read further down in the article. Maintain a large lawn with no effort. No need to pick up the grass cuttings. Perfect finish to your lawn. In terms of Cons there are very few, once you are set up you are running but there are a couple below. It’s a large initial cost but will be recouped quickly. Needs a few hours for initial set up. Will not work with steps or drops in the lawn. In terms of value for money we think it is great. It is a large investment but if you are comparing it to paying a gardener or buying a lawn tractor it is a much cheaper way of keeping a large lawn in pristine condition. Also bare in mind that you or a gardener may only cut the lawn once a week where as this will do it as often as you like giving you a really nice lawn. A definite wise buy! Installation will take you a few hours which is not that bad considering once it is done your lawn will be looked after with no work at all. The lawn is marked out with a wire that need to be pegged down into the grass. Depending on how many obstacles like trees and borders you need to section off will depend how long this takes. If your lawn is broken into zones they will need to be marked out with the wire. Once the border is marked you need to plug the base station into the mains and program the RS622 so that it mows when you want it to mow. That’s it, you can now leave it to get on with managing your lawn. In the box there is 1,100 metres of wire and a set of pegs which should be more than enough to map out your lawn and more can be ordered if needed. When it comes to spring and summer we need to cut the lawn twice a week to keep it in great condition and make it a really usable space, in reality however not many of us do this especially with a massive lawn that is 2,000 square metres. The RS622 will cut the lawn as many times a week as you want so that every time you step into the garden you have a perfect lawn. Another major benefit of the RS622 and all robot mowers is that they mulch the grass instead of picking it up which is a brilliant lawn feed. The twin blades cut the grass into fines dust like bits that fall to the bottom of the lawn for a constant feed and making your lawn really healthy and green. Now that we have run over the main points lets get down to the technical features of the RS622 and see if they are exactly what you need. You can re program the RS622 or schedule a quick cut via blue tooth or your smart phone using the Robomow app. Really handy if you are out and about and need to change the schedule that you have set. The cutting deck is not fixed directly to the mower like most robot mowers it is a floating cutting deck that will follow the contours of your lawn giving you a nicer finish. This is a feature that you really only see on high end tractor mowers and makes this model a cut above the rest. The 400 watt motor is man enough to power the RS622 for hours around large lawns, coupled with large rechargeable lithium batteries it can cut for a long time before it needs to trundle back to the charge station for a re charge. This is important as the motor will be working hard for long periods. Most of the robot mowers with smaller cutting capacities will have smaller motors and batteries. The RS622 can sense when it is raining and will not cut the lawn, but don’t worry, it will reschedule the cut for when it is not raining so you don’t miss out. A really nice feature that is a must in the UK with our prolonged patches of rain. The Robomow RS622 will make the most of the spells of good weather. If your lawn is split into a number of areas you can mark them out into zones and the mower will travel between the zones and cut the lawns. One important thing to remember is that the lawns need to attached by pathways that are suitable for the RS622 and there are no drops or steps in the way. The RS622 will cope with slopes up to 26% so it can travel up some fairly steep paths that connect lawns. This is a serious piece of machinery that is designed to replace the gardener that cuts your large lawn or the lawn tractor. Covering a huge lawn area this will give you a great looking lawn for you to use whenever you want. The initial investment will be recouped very quickly indeed and once you have one you won’t look back. 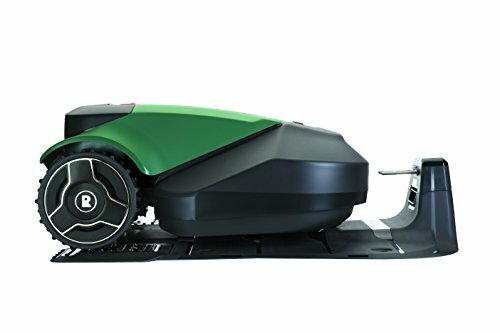 A brilliant robot mower that is quiet and easy to store. The gadgets on this are really advanced giving you maximum flexibility in controlling and programming the RS622 and the floating cut deck will give you a beautiful cut. A very highly recommended robot lawn mower from a company renowned for excellent robotic products.